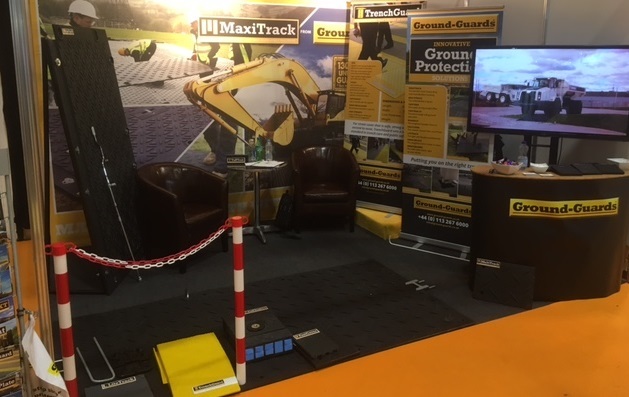 Ground-Guards was delighted to exhibit at the Executive Hire Show, which took place last week at the Ricoh Arena, Coventry. It was a packed show as usual. This year there was lots of buzz for MaxiTrack: the innovative ground protection system from Ground-Guards. MaxiTrack is super strong, guaranteed unbreakable by vehicles up to 130 tonnes. It is also extremely light however, with each mat weighing only 40kg. This means that the MaxiTrack system can be installed by hand, without the need for expensive lifting equipment. MaxiTrack mats join together quickly and easily, generating impressive on-site efficiency and a winning return on investment.